It can change your onboard experience if you choose the best seats in your cabin class. 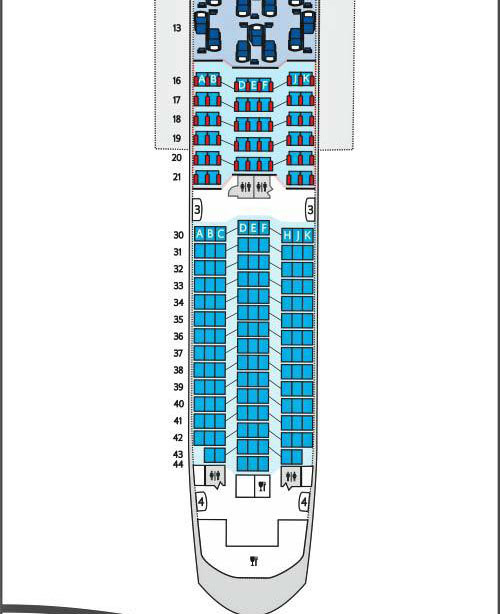 The best Premium Economy or World Traveller Plus seats on the British Airways Airbus A380-800 can be seen in the seat plan pictured above. In the article below I conclude which are the best and worst seats on this A380. There are 55 reclining Premium Economy seats on this British Airways plane. They are located on the upper deck in front of Economy and behind Club World. The cabin has its own private World Traveller Plus toilets at the back of the cabin. This Premium Economy cabin is set up in a 2-3-2 layout, so all the seats (except the middle one in the centre), have either a window or direct access to the aisle. These middle seats are only advantageous if you travel in a family of 3, so you can all sit together. For an individual traveller, these middle seats are a nightmare and the worst in the cabin. If you are looking for leg room without footrests, go for the bulkhead rows of 60DEF, 61AB and 61JK which have decent foot room, but they don’t recline as much as those in the rows behind, so for overnight flights, you may prefer the other rows. The toilets are at the back of the World Traveller Plus cabin so rows at the back may suffer from toilet flush noise; particularly 67AB, 67DEF, 67JK and 68DEF. What are the best Premium Economy or World Traveller Plus seats on the British Airways British Airways A380? I think seats 61AB and 61JK are the best Premium Economy or World Traveller Plus seats on the British Airways A380. You only have only one neighbour and you can choose between aisle or window depending on your preference. These are closest to the Club cabin and furthest from the toilets, plus they have marginally more foot room. What are the worst Premium Economy or World Traveller Plus seats on the British Airways A380? As a lone traveller, the middle seats are awful as you have no window and no access to the aisle. I would also avoid aisle seats in row 68, as these open directly to the 2 adjacent toilet doors. These are my least favourite seats. If you enjoyed this review you may be interested in reading all my Premium Economy flight reviews on British Airways, my British Airways Business Class flight reviews as well as British Airways in First.